On Thursday, the network released a brand new batch of high quality photos from The Walking Dead's Season 9 premiere. The 12 photos show off new looks for characters like Maggie, Rick, and Gabriel, and give us a glimpse into the lives of the heroes after the time jump. This new season takes place a couple of years after the Season 8 finale, so, aside from the Season 9 trailer that was released last month, this is one of our first chances to see how these characters have changed. Much like the comics, there is still a lot of story left to tell on The Walking Dead, and these new images make that very clear. You can check out all 12 of the new Walking Dead images below! 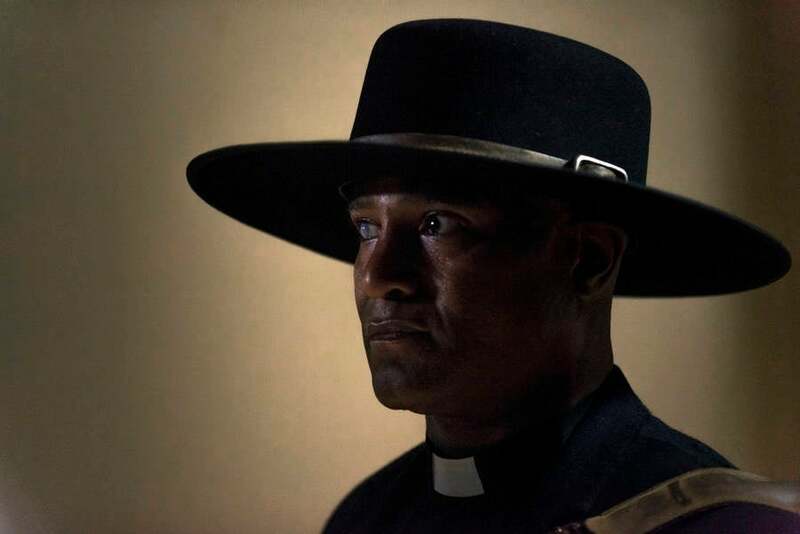 The new batch of photos starts off with a detailed look at Father Gabriel (Seth Gilliam), after his run-in with the Saviors and subsequent blinding. That right eye, combined with the new hat, is giving the priest a much more menacing, dangerous look heading into the new season. 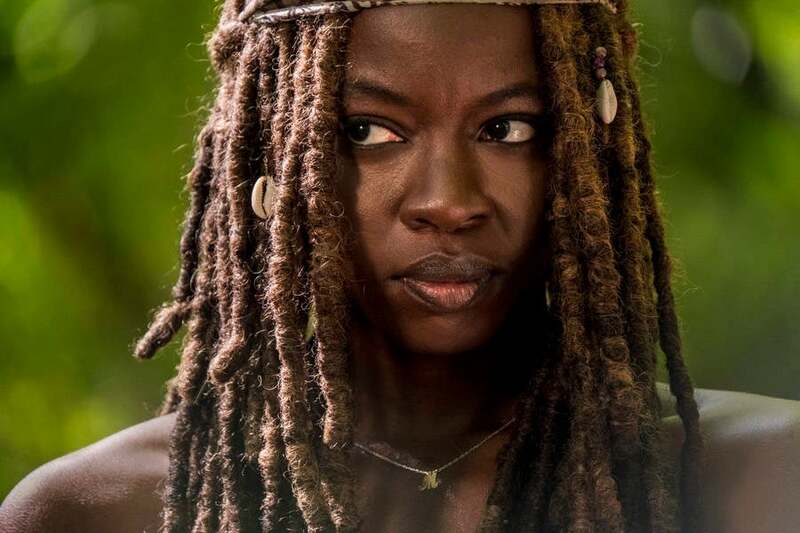 Michonne (Danai Gurira) is back in Season 9, and she will have plenty to deal with this time around. After losing Carl before the time jump, Michonne will soon have to contend with the departure (or death) of the man she loves, Rick Grimes. Just like Michonne, Daryl (Norman Reedus) is back for another battle with the undead this season. Also like Michonne, the time jump didn't change the crossbow-wielding fan-favorite character all that much. 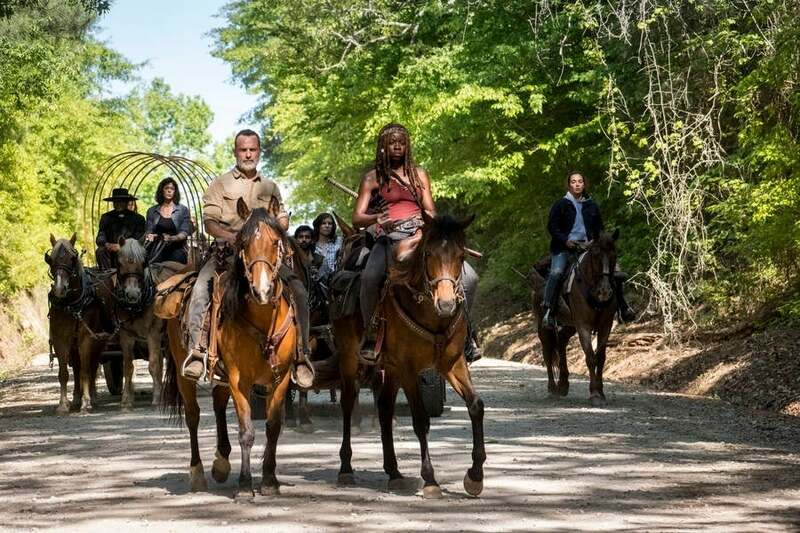 In this image, Rick (Andrew Lincoln) and Michonne (Danai Gurira) lead the people of Alexandria on a mission. It's unclear where exactly they're going, but the amount of things being taken with them suggests that perhaps the community is on the move. 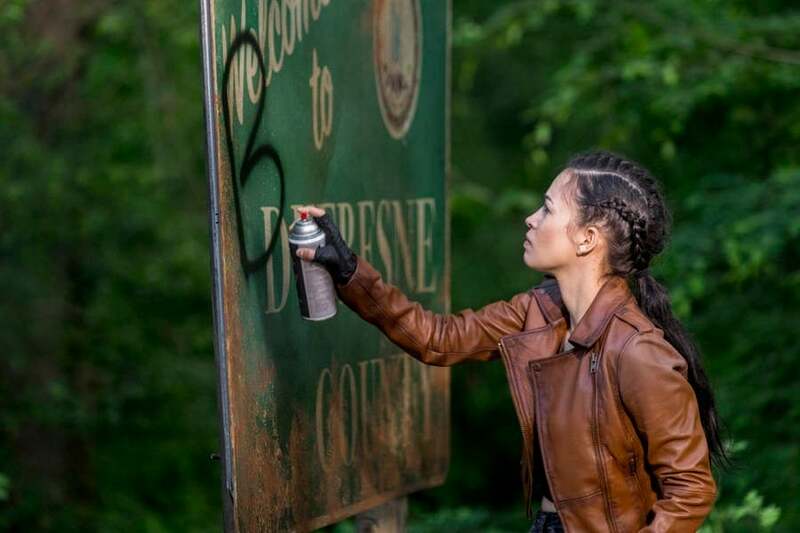 Here, Rosita (Christian Serratos) can be seen tagging one of the county line signs along the road. This could be a note for someone like Morgan to let him know where they've gone, or it could be some kind of warning, that the area is overrun with the dead. 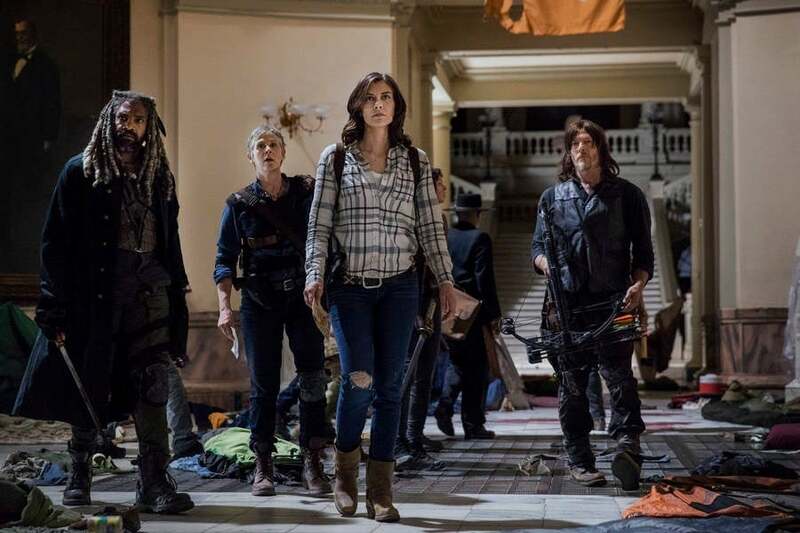 Maggie (Lauren Cohan), Ezekiel (Khary Payton), Daryl (Norman Reedus), and Carol (Melissa McBride) all stand in the middle of some sort of grand hall. 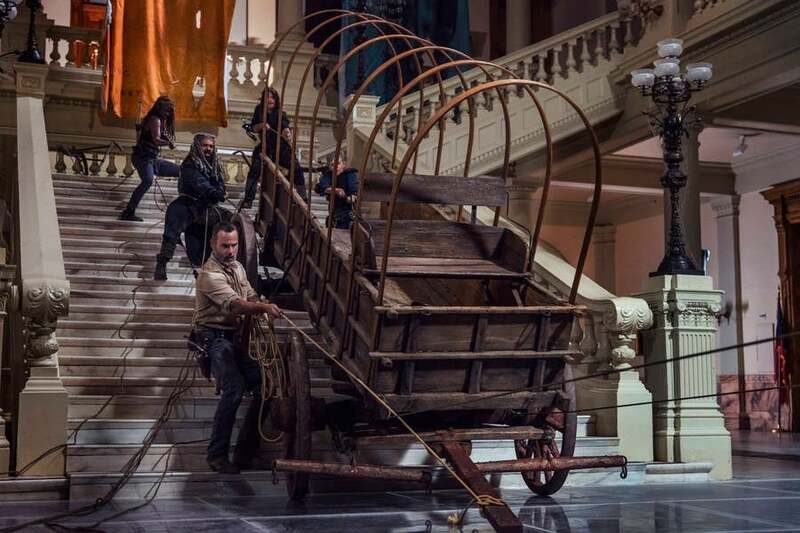 Judging by the stairs in the background, and the painting on the wall, it looks like the group may have made their way to one of the government buildings in Washington D.C.
Another shot of the group in the same building, this time working hard to get a wagon up the stairs. 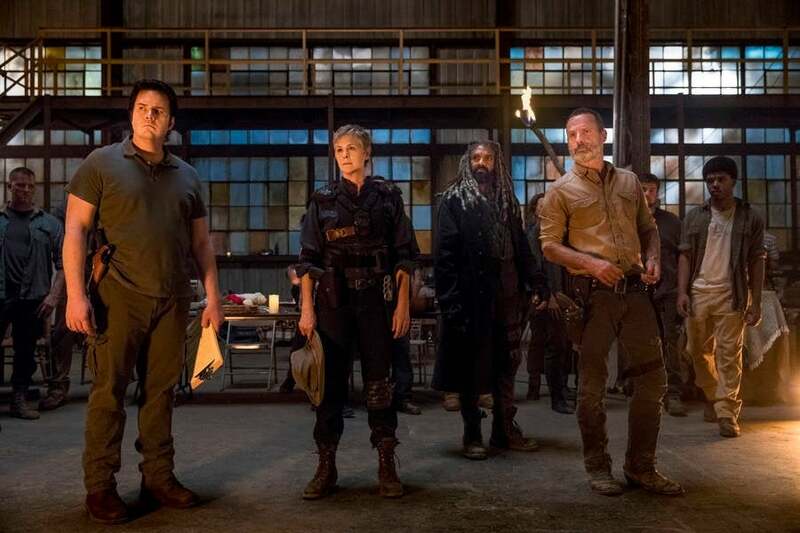 Rick (Andrew Lincoln), Ezekiel (Khary Payton), Carol (Melissa McBride), Daryl (Norman Reedus), and Michonne (Danai Gurira) are all giving their all to accomplish their mission. Season 9 is going to be a difficult affair for the Caryl shippers, because it looks like the longtime character has finally found love again. 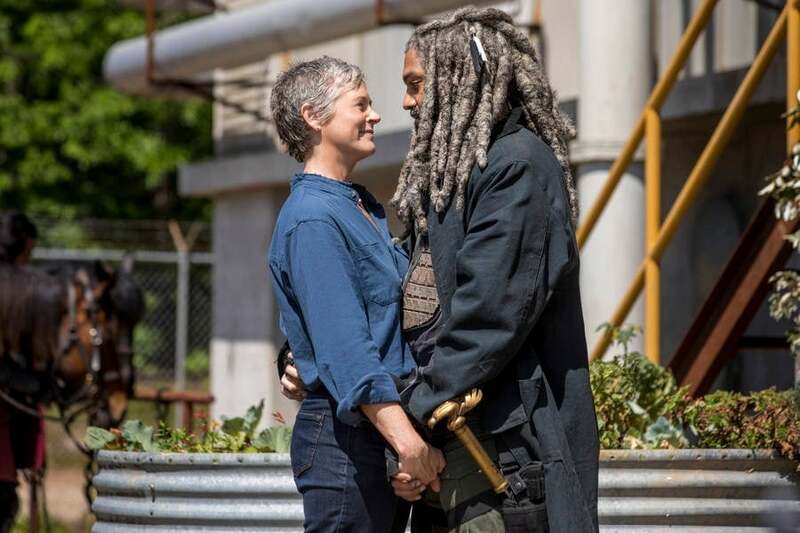 In this photo, Carol (Melissa McBride) and Ezekiel (Khary Payton) cozy up outside the walls of the Sanctuary. One of the most beloved new characters is back and better than ever in Season 9. 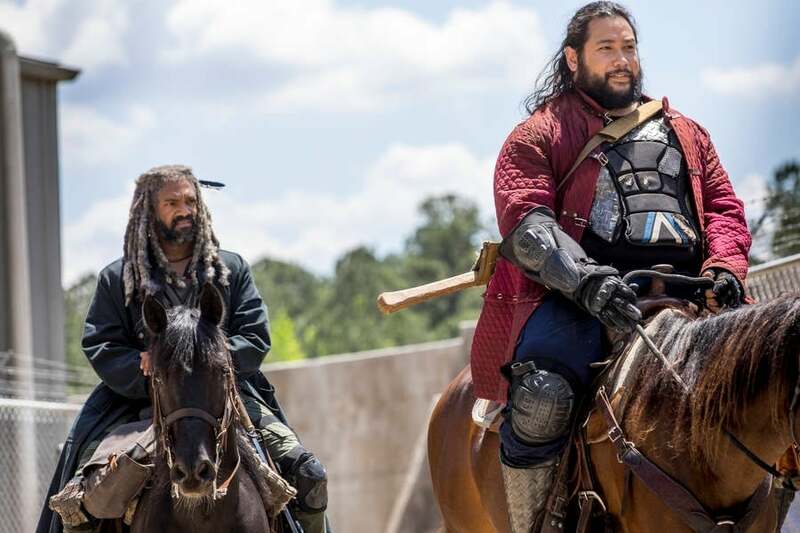 Ezekiel (Khary Payton), and his ever-loyal right-hand-man Jerry (Cooper Andrews) are seen in this photo riding away from one of the communities. As always, Ezekiel looks bewildered by something Jerry said. It looks as though Eugene (Josh McDermitt) may have taken over as leader of the Sanctuary once Negan was defeated. Since he hasn't been seen in any of the other communities yet, and he's the only former Savior that Rick could even remotely trust, it's a safe bet that he may be in charge. 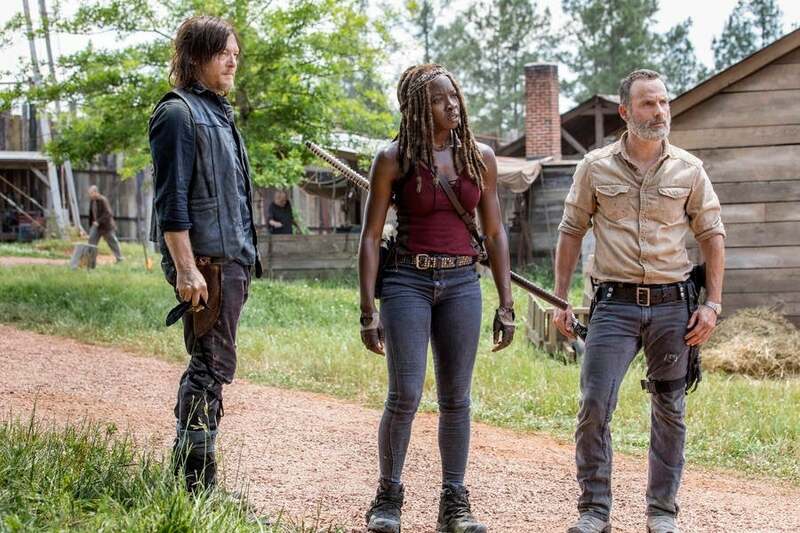 In this image, Rick (Andrew Lincoln) stands tall at the Hilltop beside his two closest allies, Michonne (Danai Gurira) and Daryl (Norman Reedus). 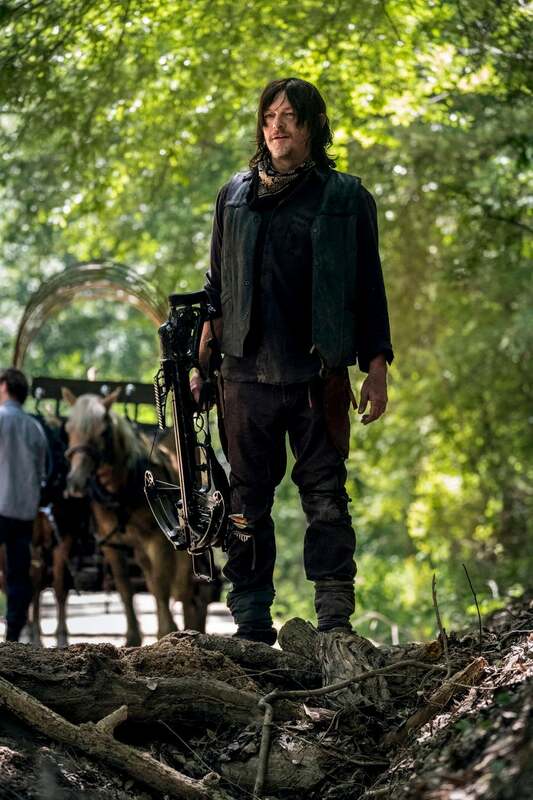 Daryl has always sided with Rick in the past, but one scene at the end of Season 8 suggests that his loyalty could be wavering. 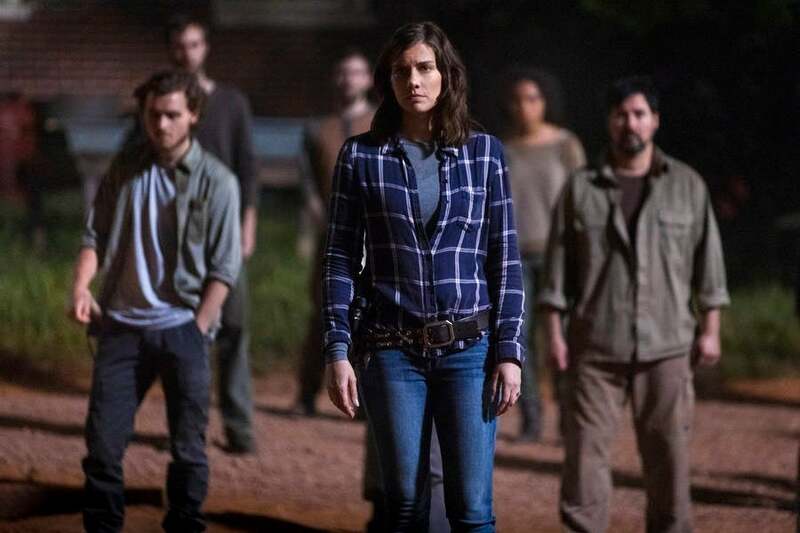 In the years since the time jump, Maggie (Lauren Cohan) has taken complete control of the Hilltop community. Here she stands, leading her people, ready to square off against any potential threat. While the Saviors have been neutralized, there are still others issues for the people of Hilltop to be worried about.